New customers only, First 3 deposits only, Min Dep £10, Max Bonus £500 + 80 Spins on Starburst, Slots only, 4x conversion, 40x Wagering. T's&C's apply. 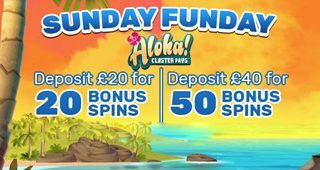 Min Dep £20, Max 50 Bonus Spins,Aloha only, 1st deposit only, valid 7th, 10th, 14th, 21st, 28th of April 20x Wagering, 4x conversion, T's&C's apply. Min yep £20 + Net Los 2.5. Max £50 Cash, 10% Losses Back. 4th, 11th, 18th, 25th of April. Cash credited following day. T's&C's apply. 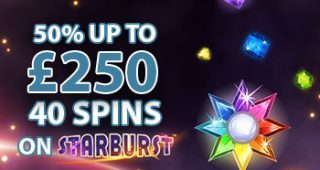 New customers only, Min Dep £20, 25 Bonus Spins on Asgard only, 3rd, 10th, 17th, 24th of April. 1 time use only, 20x Wagering, 4x conversion, T's&C's apply. 2nd, 9th, 16th, 23rd & 30th of April. 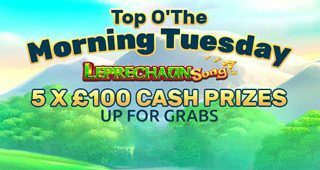 Min deposit £10, Total Prize £500, Max Prize £100, Top 5 customers with the highest single spin win amount on Leprechaun Song will win £100. Min Stake £0.20. T's&C's apply. Min Dep £20, 20 Bonus Spins on Asgard only, 1st, 8th, 15th, 22nd and 28th of April, 6pm - 10pm, 1 time use only, 20x Wagering, 4x Conversion, T's&C's apply. 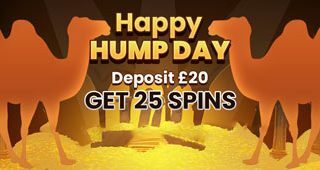 Min Dep £20, 25 Bonus Spins on Asgard only, 3rd, 10th,17th, 24th of April, 1 time use only, 20x wagering, 4x Conversion T's&C's apply. New customers only, Min Dep £10, Max Bonus £500 + 80 Spins on Starburst, Slots only, 4x conversion, 40x Wagering T's&C's apply.